Charlotte’s Web is about friendship and helping each other out. The book is based on animals who live on a farm. The farmers thought they were just ordinary animals but they were special animals that made a difference. 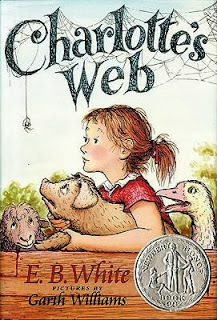 The main characters are Wilbur the pig and Charlotte the spider. Charlotte is a very smart, kind and helpful friend to Wilbur. Wilbur is funny and friendly, but is unsure of what goes on at the farm. There is also a human character called Fern, a kind little girl who loves animals, who saved Wilbur’s life by telling her father not to kill the runt pig. Fern’s father said she could raise the piglet. Wilbur discovered some bad news, that he was going to be killed for food and he was very upset. Charlotte came up with a plan. Charlotte spun words into her web to describe Wilbur so that they thought Wilbur was special and that a miracle had happened. My favourite part of the book is at the end when some of Charlotte’s spider babies stayed at the farm and made friends with Wilbur but none of them took Charlotte’s place in Wilbur’s heart. Some parts of the book can make people cry but there is a happy ending. Kids from the age of seven up to twelve years would enjoy this book. I'm glad you enjoyed Charlotte's Web, Elsie. It is one of my favourite books too (I have many!) and it always makes me cry a little bit. I love Charlotte's Web too. It's such a wonderful story about friendship. What a fabulous review, Elsie--and you're only 7!! Really great work. I still remember reading this when I was a kid. I loved it. I think the older you are, the more this book makes you cry!